Grand Champion Competition BBQ Team Qualifies To Compete at the American Royal World Series of Barbecue Invitational Contest and Jack Daniels World Championship Invitational. It’s a huge honor to win the Grand Championship at the Safeway Barbecue Battle. The Pork Barrel BBQ Competition BBQ Team has been named the Grand Champion of the 2011 Safeway National Capital Barbecue Battle. As winner of the only barbecue championship in Washington, DC sanctioned by the Kansas City Barbeque Society, the team receives an automatic invitation to two of the top prestigious contests on the professional barbecue competition circuit – the American Royal World Series of Barbecue Invitational Contest in Kansas City, Missouri and the Jack Daniels World Championship Invitational in Lynchburg, Tennessee. Over 150,000 people attended the 19th annual Safeway National Barbecue Battle in Washington, DC during the two-day competition on June 25th and 26th. The Pork Barrel BBQ Competition BBQ Team competed against several current and former world champion barbecue teams in this years contest. 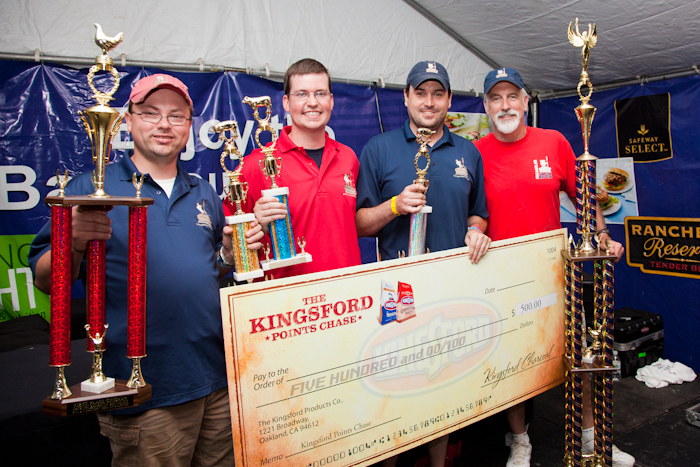 In addition to being awarded the Grand Champion title, trophy and prize money, the team also won the Perdue Sizzlin Chicken National Chicken Championship and the Kingsford Points Chase. This is the third consecutive year the Pork Barrel BBQ Competition BBQ Team has competed in this nationally recognized barbeque event. It is a meaningful competition for Thompson and Hall who entered their favorite homemade barbecue sauce in the 2009 Safeway National Capital Barbecue Battle’s “Nations Best BBQ Sauce Contest” and won Second Place in their first ever barbecue competition. Last year, the team won the event’s “Chinet Peoples Choice” award for best BBQ sauce. Hall and Thompson, the sauce company’s co-founders, are recognized as two of the most creative and entrepreneurial minds in barbeque. The company recently released Que Cologne – the world’s first Eau de Barbecue. Since their appearance on ABC’s hit reality TV show Shark Tank in 2009, they have expanded their business from creating BBQ sauces and spice rubs in their home kitchens to selling award-winning BBQ products at over 1,300 stores across America including Safeway, Whole Foods, and Costco. Their inaugural cookbook, the free Pork Barrel BBQ Guide to Tailgating, received praise from food and sports fans across America, and their sauce was recently named Best Sauce in America and one of “The 125 Best Foods for Men” by Men’s Health Magazine. Entrepreneurs Hall and Thompson recently launched the world’s first social network dedicated exclusively to barbecue, http://www.BBQBackyard.com, and the company will soon open its first restaurant in Alexandria, Virginia this summer. They continue to earn support from avid barbecue fans with their top-ranked Pork Barrel BBQ Blog and as the number one most followed BBQ company on twitter (http://www.twitter.com/porkbarrelbbq). For more information, visit the Pork Barrel BBQ website http://www.porkbarrelbbq.com and read about their latest updates and adventures on Facebook, Twitter and the company’s blog. Pork Barrel BBQ was founded in December 2008 during the peak of the economic crisis to prove that a company not owned or operated by the federal government could succeed, and that if you had a good idea, it was still possible to grab a piece of the American Dream. Pork Barrel BBQ founders, Heath Hall and Brett Thompson, ran the company out of the basement of their houses, selling their award winning BBQ products one bottle at a time. 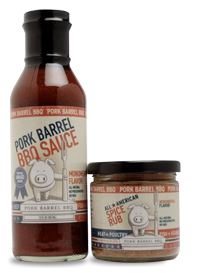 In less than one year, their Pork Barrel BBQ Sauces and Spice Rub were carried in over 1,000 stores in 40 states. Throughout their journey, they have stayed true to their mission – to unite the nation through the great tradition of BBQ, and bring bipartisan flavor to your next meal. The Pork Barrel BBQ Competition BBQ Team entered its first contest, The Safeway National Capital Barbecue Battle, in June 2009, and walked away with two trophies – Second Place in the “Nations Best BBQ Sauce Contest” and Fourth Place for their pulled pork in the Memphis In May portion of the contest. Since then, the team has won multiple awards, including the “Chinet People’s Choice” award for best BBQ sauce in 2010 and other notable Memphis in May and Kansas City Barbecue Society BBQ competition accolades as well as having their Pork Barrel BBQ Original BBQ Sauce named Best Sauce in America and one of “The 125 Best Foods for Men” by Men’s Health Magazine in November 2010. For more information, visit http://www.PorkBarrelBBQ.com or follow Pork Barrel BBQ on Facebook (http://www.facebook.com/porkbarrelbbq) and Twitter (@porkbarrelbbq).